The spindle bore diameter of Model EE Lathes is 98mm. 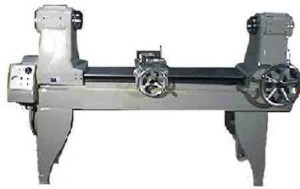 The six different models of EE Lathes represent six different bed lengths. Lathes can be purchased with motorized firecarriage and tailstock: additional sheets for motorized versions are available upon request. Lthe bed scales are a standard feature. Model EE Lathes have an infinitely variable timing elt drive with the following features: spindle On/Off, speed and direction controls: jog switch for spindles; and sockets which allow connection of remote control devices for control of spindle On/Off and speed functions. An optional tailstock spindle On/Off feature (co-axial) is available for certain models indicated below. The co-ax version of EE199 is limited to a maximum speed of 100 RPM. The spindle bore diameter of Model EE Lathes is 98 mm. 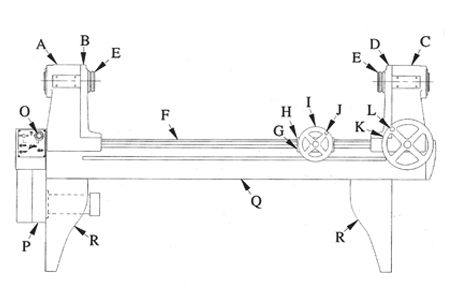 The six different models of EE Lathes represent six diferent bed lengths. Lathes can be purchased with motorized firecarriage and tailstock: additional sheets for motorized versions are available upon request. Lathe bed scales are a standard feature. Accessories must be ordered separately. Additional information on individual accessories which are listed can be obtained under each accessory's respective catalog listing. For information on burners and paddles, refer to the Burner section of the catalog . Note: Other electrical supplies can be accommodated at extra cost. *Pricing is for raw lathe only (no accessories). Prices checked on October 1, 2008 and are subject to change without notice! Lathes can be purchased with a standard firecarriage cover and standard burner mount or with a T-slot firecarriage cover and/or a rack and pinion burner mount. The desired specification must be specified. Prices checked on October 1, 2008 and are subject to change without notice!